Fergal McGirl Architects – is external wall insulation appropriate to dublin’s early 20th century housing stock? 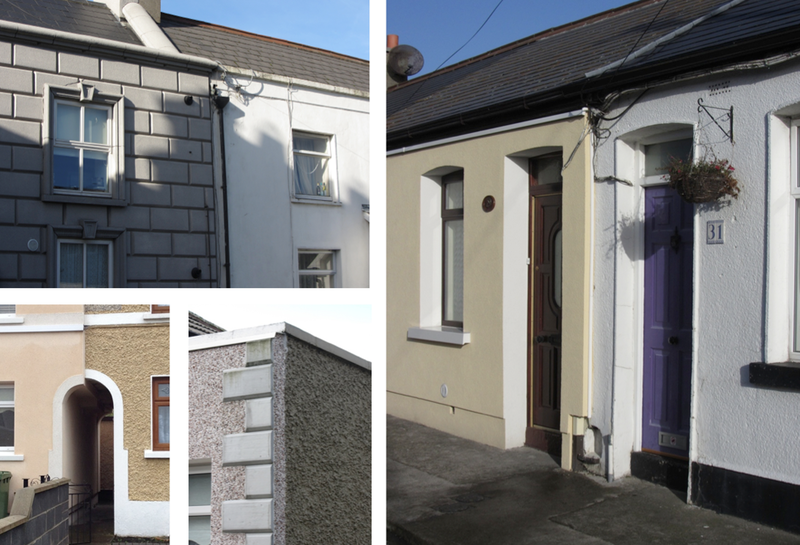 is external wall insulation appropriate to dublin’s early 20th century housing stock? February 10, 2016 by fmgarchitects. External wall insulation has become more common in Dublin in recent years and has become prevalent in the early 20th century estates of Marino, Donnycarney, Cabra and Crumlin. If carried out correctly, It offers a technically robust method of insulating dwellings without impact on internal fittings and finishes. With many houses in these estates between 75 and 90 years old, it is inevitable that there will be a drive to bring them closer to modern standards. The challenge is to do this without the loss of their special character and interest and with regard to their collective architectural value. For example, the simple plaster features that unify the streetscape can be lost entirely or poorly reproduced. Step-outs at the party wall line to un-insulated terraced neighbours and “cut-outs” around services can be unsightly. Deepened window reveals, loss of depth and detail at eaves and a flattened appearance can set them apart from the uniform context of the street and their neighbours. There is a body of planning permissions and section 5 applications (to determine if a development constitutes exempted development) which indicate that external wall insulation is not always exempt from planning permission requirements. The context of the house – whether it is terraced, the existing external finish and details of the house and it’s context as well as the proposed finish of the works will influence the decision. Interesting discussion. Opens up issues of observing the form of the neighbourhood or terrace but having poor thermal performance or achieve good thermal performance but risk being out-of-step with you neighbour. Are there guidelines available to consider what represents ‘good practice’ e.g. depth, finish, methods of dealing with the interfaces? Im working on a study with others for Dublin City Council due to be published soon that will look at this and other issues. One of the questions asked is if EWI is necessary in houses where for example they area terraced and you have a modern rear extension so the relative heat loss area of external walls is quite low. It always worth looking at the overall geometry and heat loss of a building (by means of BER analysis or other) before deciding on a retrofit approach. The impact on the heritage value of the building (even early 20th C) and context is something that I don’t think is fully considered.